And thence we came forth, to see again the stars. But the stars that marked our starting fall away. We must go deeper into greater pain, for it is not permitted that we stay. How brief a blaze a woman's love will yield If not relit by frequent touch and sight. To get back up to the shining world from there My guide and I went into that hidden tunnel, And Following its path, we took no care To rest, but climbed: he first, then I-so far, through a round aperture I saw appear Some of the beautiful things that Heaven bears, Where we came forth, and once more saw the stars. Thou [Virgil] art my master and my author, thou art he from whom alone I took the style whose beauty has done me honor. But when thou shalt be in the sweet world, I pray thee bring me to men's memory. "The Royal Banners are coming forth — those of the master of hell — towards us now; so look ahead and see," my master said, "whether you can discern him." The greatest gift that God in His bounty made in creation, and the most conformable to His goodness, and that which He prizes the most, was the freedom of the will, with which the creatures with intelligence, they all and they alone, were and are endowed. This mountain is such that it is always hard at the start below and the higher one goes it is less toilsome. It was now the hour that turns back the longing of seafarers and melts their hearts, the day they have bidden dear friends farewell, and pierces the new traveler with love if he hears in the distance the bell that seems to mourn the dying day. A Galeotto [a pander] was the book and writer too: that day we did not read any more. Thou shalt prove how salt is the taste of another's bread and how hard is the way up and down another man's stairs. The mind which is created quick to love, is responsive to everything that is pleasing, soon as by pleasure it is awakened into activity. Your apprehensive faculty draws an impression from a real object, and unfolds it within you, so that it makes the mind turn thereto. And if, being turned, it inclines towards it, that inclination is love; that is nature, which through pleasure is bound anew within you. 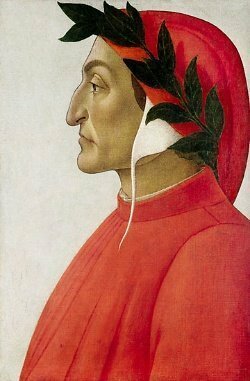 Bio: Durante degli Alighieri, simply called Dante, was a major Italian poet of the late Middle Ages.